During the Hundred Years’ War, the kings of England got into a big fight about who should be king. There was a long civil war in England. One side was the Lancaster side. They took a red rose as their symbol. In 1399 AD, at the beginning of the civil war, Richard II was king of England – that was the Lancaster side. The other side was the York side. They took a white rose as their symbol. Richard’s cousin Henry – another of King Edward III‘s grandsons – killed Richard and made himself King Henry IV. That was the York side. When Henry IV died, his son succeeded him as Henry V, who fought in France in the Hundred Years’ War but got killed. Henry V’s son Henry VI succeeded him in turn. So he was another York ruler. But he suffered from mental illness and couldn’t rule very well. He ended up losing the Hundred Years’ War and all of England’s land in France. Then he seemed like a loser. People thought they might do better with a different king. Richard, Duke of York – another York dude – thought he would be a good choice. Like Henry V, Richard was also Edward III’s great-grandson. Richard never succeeded in becoming king, but when Henry VI died, Richard’s son Edward IV did become king. And after Edward IV died his younger brother ruled as Richard III. 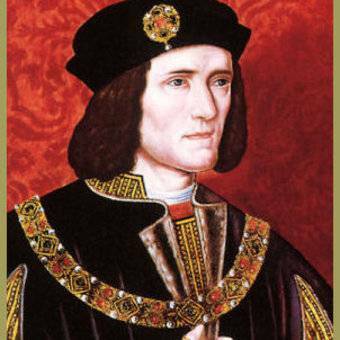 Richard III fought with his army even though he was born with scoliosis that twisted his back. All of these men were on the York side. It looked like the House of York had won the Wars of the Roses. But then the Lancaster side found new energy in a man named Henry, who decided to fight to be king. He was almost totally unrelated to any earlier king – his grandfather had just been Henry V’s widow’s second husband. But Henry got major military support against Richard from Anne, who was ruling France. 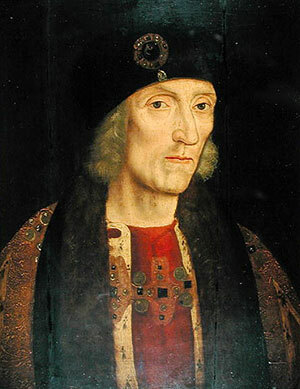 In 1485, Henry VII killed Richard III at the Battle of Bosworth Field and became king. That was the end of the Wars of the Roses, so the Lancaster side won. Cite this page: Carr, K.E. Wars of the Roses – Medieval England. Quatr.us Study Guides, August 3, 2017. Web. April 23, 2019.